I have slept in the Hotel Evergreen. The breakfast was very small. The room and wireless were ok. I have got luck, that other German people wanted to go to FOSDEM, too. They have been in the same hotel and knew the way from the last years. 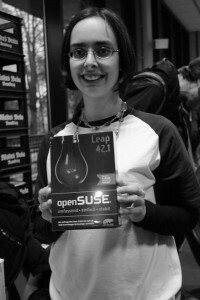 They shown me the different houses and I went directly to the openSUSE booth, where some of the community were available. CentOS was our neighbor. We all have got gloves and tee shirts by them. They have got beer by us. I have got new t shirts. I wore one of last November with the new release. I was a little bit surprised, that we would have a new one again. DVDs with Leap were available, too. They were burned in December – the last month of Open Source Press. They closed. That was my first question, I asked Richard. He told me, that they have closed for books, but would produce DVDs for a longer time. It was a full day for us at the booth. We disposed beer and t shirts. I new many faces from OpenRheinRuhr, FrOSCon and GUUG. It has been more famous faces I thought to know. I will see many of them at the FFG of the GUUG again. I made a trip through the house to the other booths. People of our DevOps meetup group wanted to have Jenkins stickers. I took some of them. I bought a tee shirt by them, too. After that I heard, that they would have Jenkis meetup groups everywhere on the world, but not in Germany at the moment. We have got so many meetup groups for it in Karlsruhe and not Jenkins? It would be too late for me, because I want to change the town in May. I will give it to our organisators and take it with me for Nuremberg. I was interviewed by the Hacker Public Radio. They wanted to have a interview at every booth. My sound wasn’t very good after a common cold, but I did it. All my Open Source friends were coming to me at the booth. I gave Douglas some hints for the next oSC. I don’t know at the moment, whether I can come, because that will be my second month living in Nuremberg again. In the evening of the first day some community members wanted to go out for eating and drinking. At the end we let it for being fit for the next day. At the next day the FOSDEM wasn’t so full like the day before. At the beginning I created a plan for visiting talks. I have got the next interview with a PhD student of the TU Berlin for his doctor thesis. His doctor father told him wrong things about the difference between Microsoft and Linux projects. Some things have been right, but our support can be faster than the support of Microsoft. And we get more and more customers by them. My first visit to a talk was Literate DevOps for Configuration Management. I hoped a little bit more about this presentation. During the presentation I thought about doing every step with sed. My directly neighbor was another student at the German distance teaching university (Master Praktische Informatik). He wanted to know, how you can get more support by the university. I told him about our facebook group, newsgroups and irc. He was surprised, that the university would have irc channels. After his stories about his first studying (business information technology) und Hagen I am happy, that I want to change to Nuremberg. I don’t need a education degree by a university on the level of a university of applied science. After that I went to Big Data meets fast Data. I have got luck for getting a free place. It was a presentation about different in-data-memory databases. That was very interesting for me. After that I took a conference waffle with me to the booth. I saw some people of B1 Systems again. At the end of the day I have got a openSUSE box by Richard. 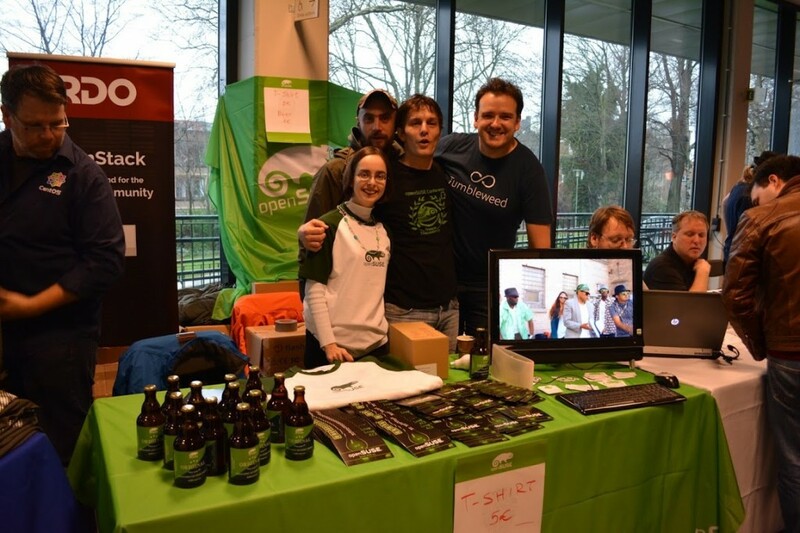 I am looking forward to the future of the openSUSE box (perhaps without Open Source Press). Thanks for the wonderful 2 days and the Travel Support. That was my first chance for coming to FOSDEM, because normally that’s the time for learning for the university. I have done a break this semester. I was able to take a lot with me. Next year I will have learning on the program at this time again.